These low carb Halloween chips are the perfect cinnamon snack to serve during the celebrations! Sugar free and keto recipe. Some time ago I made some low carb cinnamon chips from low carb wraps – which in turn are a version of my homemade tortilla chips. They are so easy to make! 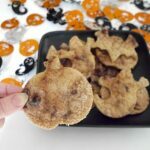 Recently I decided to make them again but just as I was about to cut the wraps into wedges, I decided to use Halloween-themed cookie cutters and make shaped chips instead! 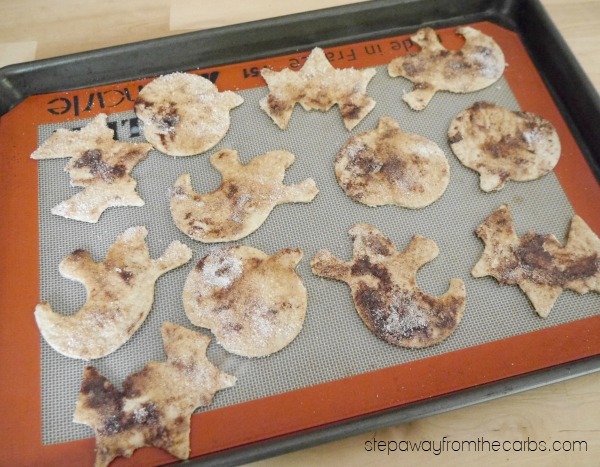 I was also inspired by this idea on Homemade Hooplah to dip the shapes into butter before coating with the cinnamon. So here’s how to make them! 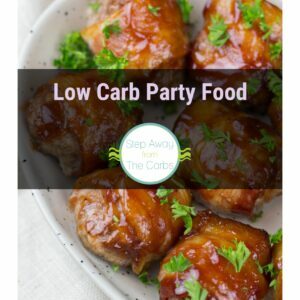 Grab some low carb wraps (I’m using 4g net carb Wholewheat Soft Taco ones from Mission as my usual 3g ones were out of stock!) and some cookie cutters. Press out as many different shapes as you can manage to fit into each tortilla! Note: The wraps I used had a 6.5″ diameter and I found that I could just squeeze in one pumpkin, one ghost and one bat from the Wilton cutters onto each wrap. Melt the butter in a bowl. Mix together your favorite low carb sweetener and ground cinnamon on a plate. Dip each shape into the butter, then into the cinnamon mix. You can do one side or both – but you may need to increase the cinnamon mix if you do both. Place each dipped shape onto a baking sheet lined with a silicone mat. Bake in a preheated oven for 5-7 minutes or until the chips have turned crispy. These chips are best eaten warm from the oven while they are still buttery and gorgeous, or at least eaten the same day. 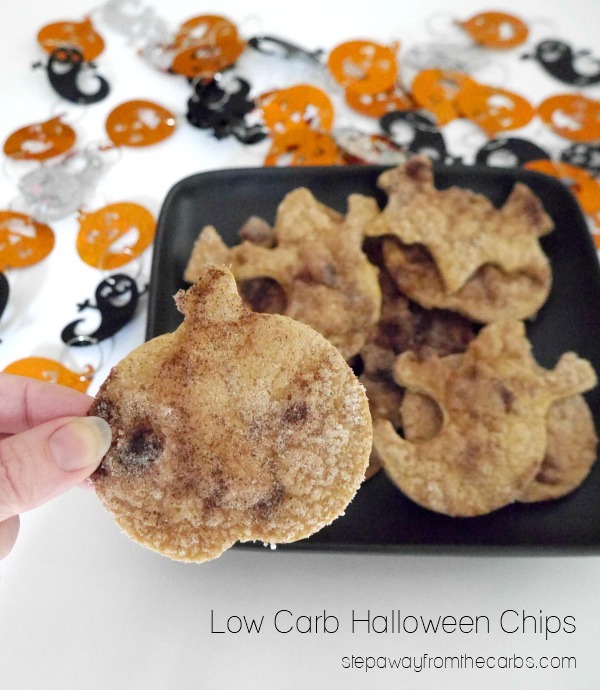 Happy low carb Halloween! 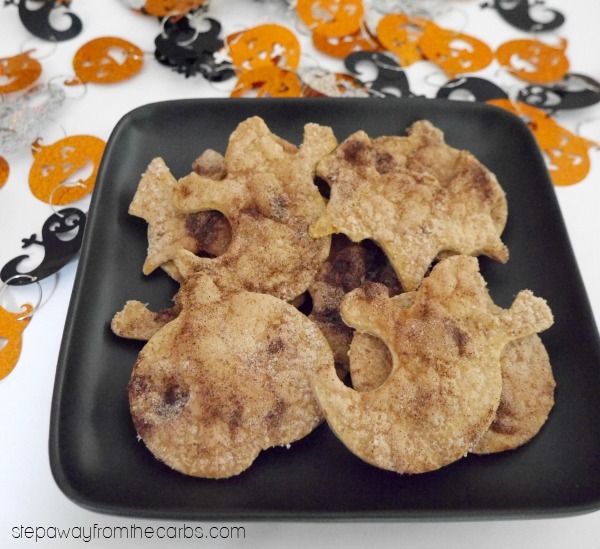 These low carb Halloween chips are the perfect cinnamon snack to serve during the celebrations! 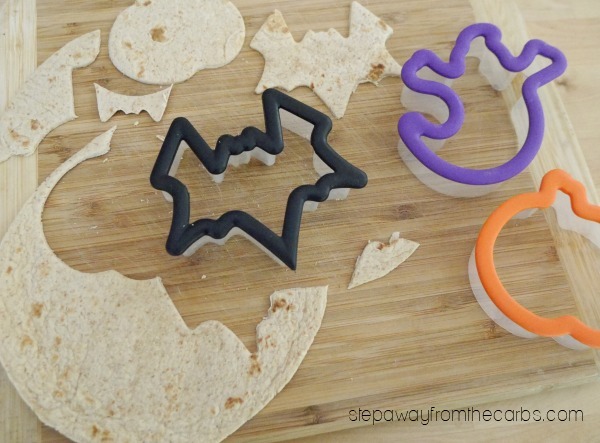 Use cookie cutters to cut the tortillas into Halloween themed shapes. Mix together the cinnamon and sweetener. Dip each tortilla shape into the melted butter, then into the cinnamon mix, then onto a baking sheet lined with a silicone mat. 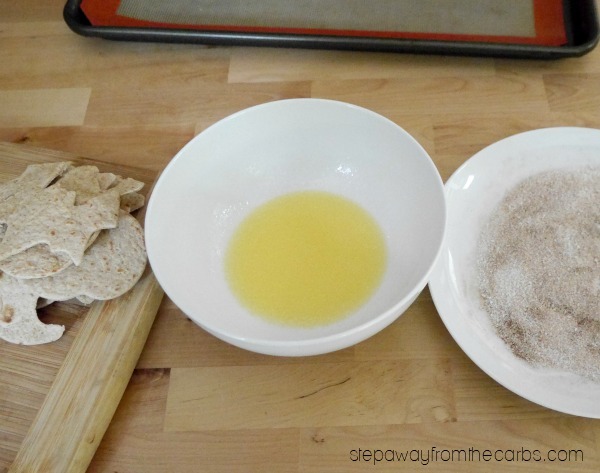 Bake the chips for 5-7 minutes or until crispy. How. fun! I’m going to use gluten-free tortillas and make these with my children. Thanks for the cute idea. What a BRILLIANT idea! Love it. This is cookie making without all the work. Thank you!!! LOL I never thought about it like that! Fun idea! My kids would love these. I have made these twice already – and eaten them all! Yummee!